Since man first evolved to stand on two feet, we’ve been running on them. As our ancient ancestors trekked barefoot across countless miles of grassland in search of wild game, they were laying the groundwork for the long-distance runners of today, exploring the wonders of bipedal movement and the incredible potential of the human body. Though our society may have since developed beyond the need to hunt woolly mammoths on foot, running is hard-wired into each of our systems. When you first consulted a doctor for weight loss, it may have been many years since you’d felt your feet pound the pavement, wind whipping through your hair—but now, during your weight loss program or fat burning injections, is the perfect time to explore that sensation again. As you’ve likely been told by your doctor, weight loss requires a multifaceted approach. While you change your diet and lifestyle habits to maximize your weight loss, you’ll also need to increase your activity levels—and few workouts will give your body as many benefits as running. Every mile you run will burn about 100 calories, while running is also one of the best aerobic exercises for conditioning your heart and lungs. Running can improve your circulation, reduce stress, increase your energy levels, boost your stamina, make your bones healthier and reduce your risk of medical conditions from the common cold to cancer and heart attack. But all these benefits are hard-earned—starting a running routine is notoriously difficult, and maintaining one is even more so. Still, you’ve made huge strides towards a healthier life by consulting a weight loss doctor—you can take that journey to the next level by devoting yourself to a healthy activity like running. Walk before you run. You’ll need to build up your body’s strength and stamina to help it adjust to the strain of running, especially if you haven’t been exercising regularly. To help yourself adjust, start by taking four 30-minute walks each week. Set a steady but comfortable pace, taking your fitness level into account. Remember: a workout should never feel like punishment—if you’re out of breath, give yourself a break to catch it. The art of the slow start. When you’re able to complete four 30-minute walks in a week with ease, you’re ready to start running—but don’t take off sprinting yet. You still need to ease yourself in, to keep building the muscles all over your body that contribute to an efficient run. Start mixing in one minute of running for every four minutes of walking, again doing a 30-minute workout three to four times a week. Your running pace doesn’t have to be any faster than your walking pace—just get yourself used to the sensation. Build up momentum. Once you can do the above step easily, it’s time to start increasing your running intervals. Try moving things up to three minutes of running and three minutes of walking, then five minutes of running and two minutes of walking. As you build up stamina each week, you’ll find yourself able to go further. 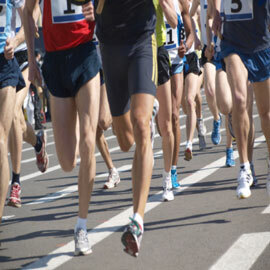 Listen to your body and gradually increase the amount of running you do. Remember: this isn’t a race (yet). Run. Though many runners keep their walking increments indefinitely, you may be able to phase them out entirely by around your 12th week. Try running for 20 to 25 minutes, then walking five minutes to cool down. Remember: we all run at our own pace. By devoting yourself to a gradual running build-up like this one, you can condition yourself to run, but don’t be discouraged if it takes you a while to get there. Of course, any runner will also need a pair of supportive running shoes, some reliable workout clothes and plenty of water. Think you’re ready for the challenge? Talk to your weight loss doctor and get out there! Have you used a gradual plan to build up to running like this one? Share your experiences, tips and questions with us in the comments below!